SYRACUSE, N.Y. (CNS) — In the spirit of Advent as a season of hope, Syracuse Bishop Robert J. Cunningham said he hoped the Dec. 3 release of a list of clergy credibly accused of abusing minors over the past 70 years would bring “some peace and healing” to those directly affected and to the faith community at large. “It is important to note that this list has been provided to the district attorneys of all counties in the diocese,” Bishop Cunningham said. The list can be found at www.syrdio.org and www.thecatholicsun.org, which are, respectively, the websites of the diocese and The Catholic Sun, which is the diocesan newspaper. “As this holy season of Advent begins, our Catholic faith reminds us that this is a time of preparation, a time to set our minds and hearts toward the coming of Jesus Christ,” Bishop Cunningham said in his Dec. 1 letter. “For many, the practice of prayerful reflection during this time is often disturbed by the chaos in our own lives and the lives of those around us. “It is in that spirit that I am compelled to write to you,” he continued. “The news over the past few months of the tragic failings of the Catholic Church has been deeply distressing and has caused many to lose faith and trust. It continues to weigh heavily on our hearts. “Personally for me, as your bishop, I have prayerfully considered what I can do to help rebuild trust and forge a path to restoring and strengthening the faith,” he said. Bishop Cunningham acknowledged that many are aware there is “divisiveness in the diocese” over the release of names of those with credible allegations of sexually abusing a minor. “Over the years, I have explained that there are individuals who have been harmed who wish to have all of the names published and others who have explicitly asked to not have the name of their abuser made public,” he explained. His letter also outlined the measures the diocese has taken to address abuse. 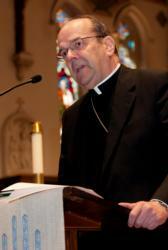 Since 2002, he said, the Diocese of Syracuse has fully implemented the articles of the “Charter for the Protection of Children and Young People,” including a “Comprehensive Child and Youth Protection Policy,” which applies to all clergy, religious, employees and those volunteers whose ministry puts them in contact with children, young people and vulnerable adults. The diocese also has a safe environment program, which requires training, education and criminal background checks of clergy, religious, employees and volunteers whose ministry places them in contact with children, which must be renewed every five years. The program also requires prevention and educational programs for children in the Catholic schools and faith formation classes. As of November of this year, the diocese said, it has credentialed over 42,000 adults and over 15,000 children through the program. The diocese also has an Office of Victim Assistance and a Diocesan Review Board composed of qualified lay professionals, a priest and member of the religious “to oversee investigations into allegations of clergy sexual abuse of a minor once the district attorney’s office has completed its review. In February 2018, the Syracuse Diocese initiated the Independent Reconciliation Compensation Program to offer reparation, promote reconciliation and further healing to individuals who, in the past, were sexually abused by members of diocesan clergy. “The program is nearing its conclusion and a full report will be provided to the people of the diocese,” according to Bishop Cunningham’s letter.